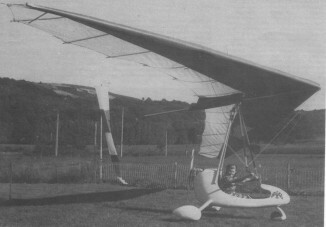 Single-seat or two-seat single-engined flex-wing aircraft with weight-shift control. Rogal-lo wing. Pilot suspended below wing in trike unit, using bar to control pitch and yaw/roll by altering relative positions of trike unit and wing. Undercarriage has three wheels tricycle formation; glass-fibre/carbon-fibre suspension on all wheels. Nosewheel steering independent from yaw control. Glass-fibre/ Kevlar/carbon-fibre trike unit, partially enclosed. Engine mounted below wing driving pusher propeller. Other data dependent on customer's specification. Robert Bardou is a crafts-man who specialises in the fabrication and building of single-seat and two-seat trike units suitable for fitting to unmodified hang-gliders without modification to them. Called Choucas, these 'chariots' are built according to the desires and requirements of the purchaser. Each model is designed according to the power pack chosen, virtually all engines being suitable, and each Choucas is built of laminated glass-fibre and epoxy with reinforcements of uni-directional Kevlar and carbon-fibre. The legs of the main landing gear and the nosewheel fork (steerable and fitted with a brake), are also made of uni-directional glass-fibres, criss-crossed with reinforcement of carbon-fibre. The engine mountings are formed from Duralumin inserts incorporated at the time of moulding wherever bolts are considered necessary. Of remarkable lightness - around 441b (20kg) for a single-seater without power pack, these Choucas trike units attach to the wing with a fork built of two Duralumin struts, forming an inverse V. Each of these tubes is held to the shell of the trike unit by two bolts through the strong points. De-rigging the two lower bolts allows these two struts to fold forward onto the trike unit for transport. No two are alike.